A short story about an Iranian man in Paris and his unusual plan for gaining asylum. 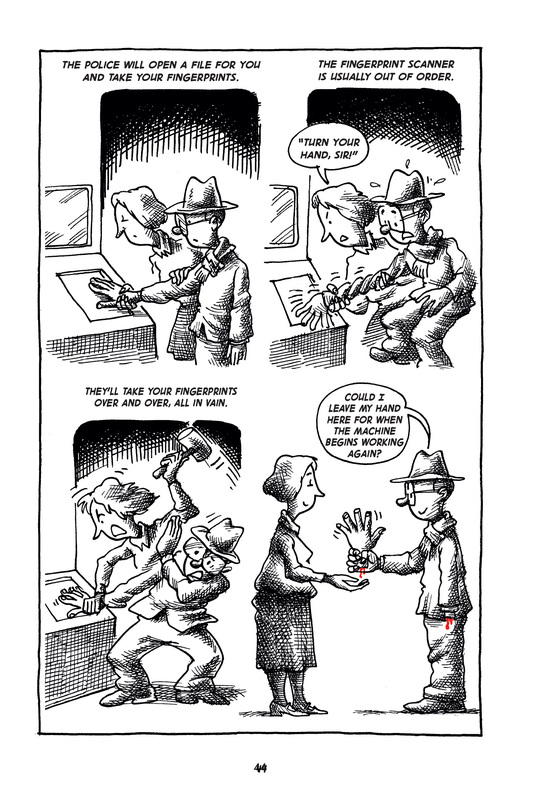 Graphic fiction about a Bedouin tour guide seeking to avenge himself on a racist tourist. A different attempt to immigrate, across the U.S.-Mexico border. 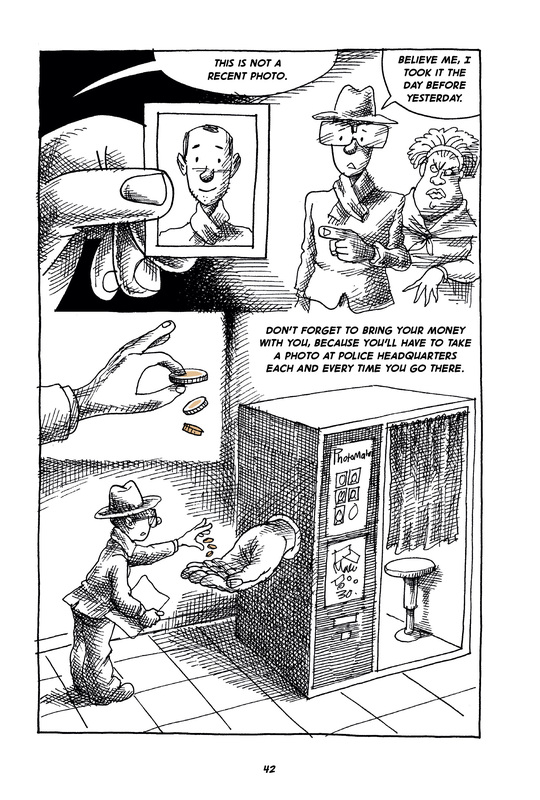 In the satirical "guide" below, cartoonist Mana Neyestani draws on his own experience as an Iranian refugee in Paris. Click the Next button to read the story. 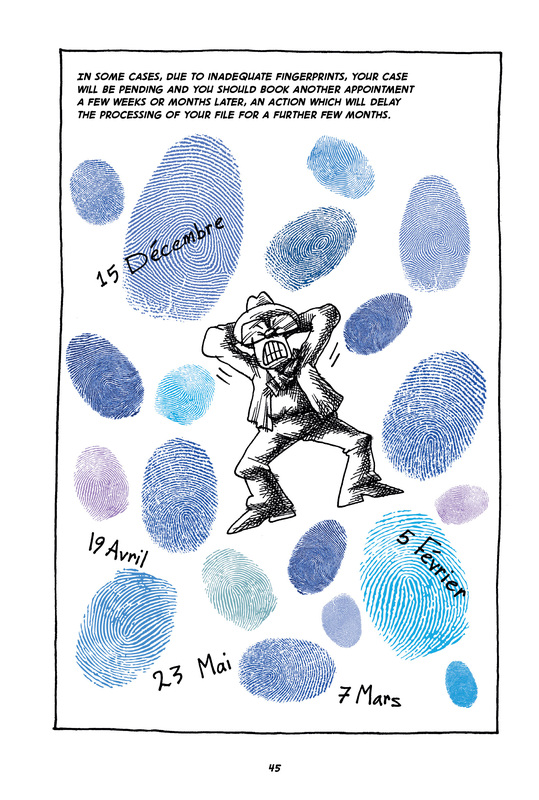 Le Petit manuel du parfait réfugié politique © 2015 Arte Éditions/Éditions çà et là. By arrangement with the publisher. 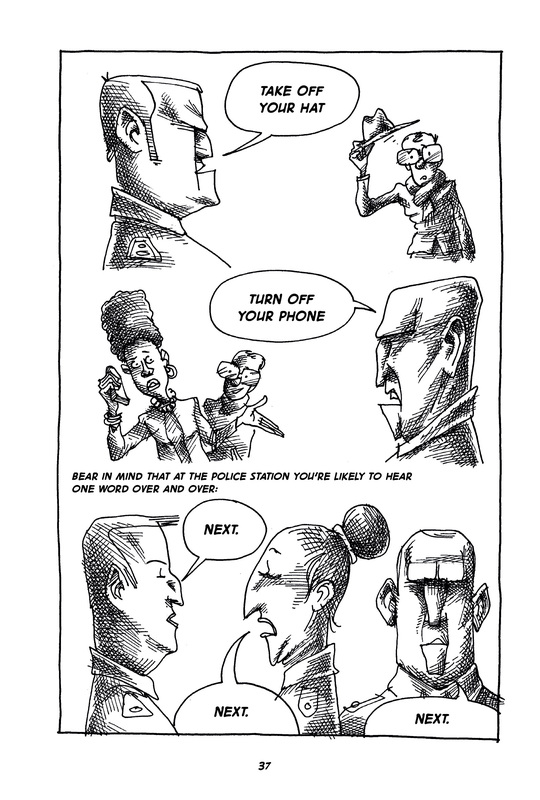 Rights arranged by the Nicolas Grivel Agency. Translation © 2016 by Ghazal Mosadeq. Lettering by Irvin Carsten. All rights reserved. Television image of Neyestani during an interview with VOA Persian, 2010. 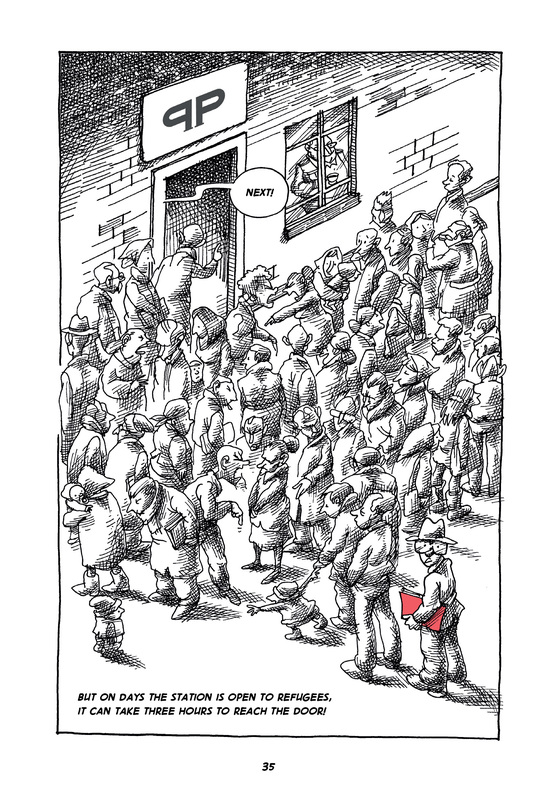 Iranian cartoonist Mana Neyestani was born in Tehran. For several years, he worked for the government magazine Iran. His use of an Azeri word for "cockroach" in a children's cartoon published in May 2006 triggered riots among the Azeri minority, already persecuted by the Iranian government. 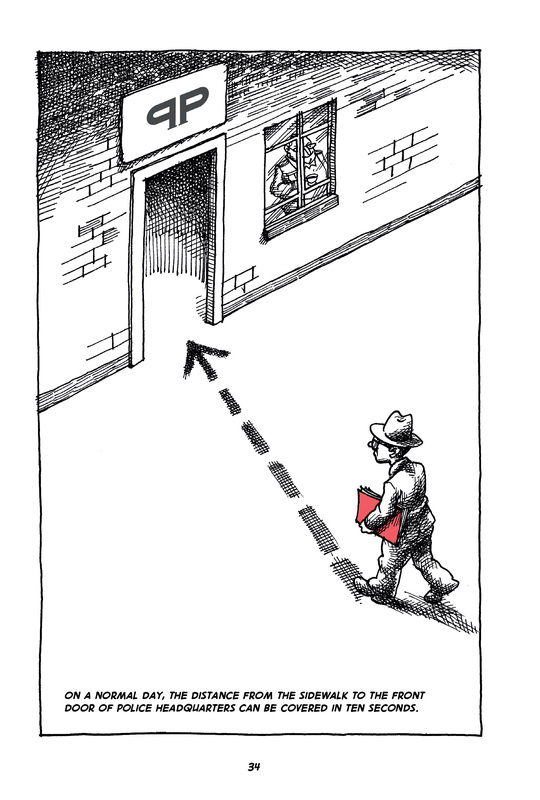 The newspaper closed and Neyestani spent months in prison. Upon his release he emigrated to Malaysia and now lives in Paris. 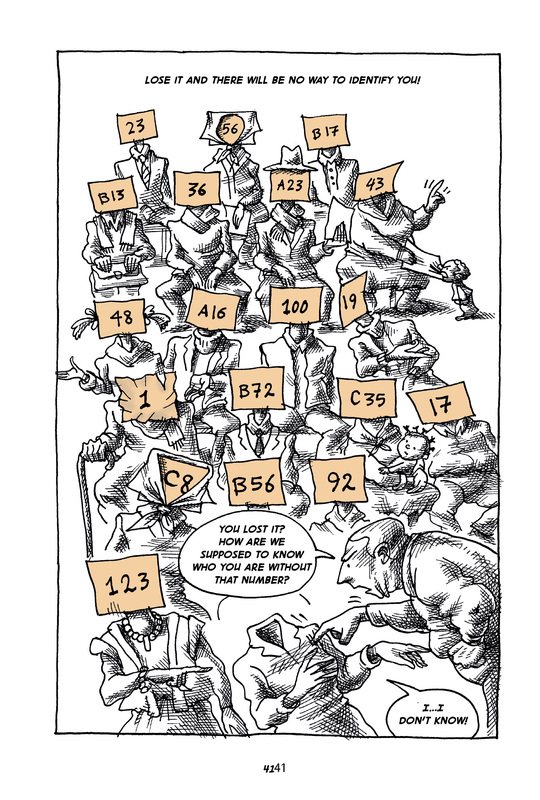 He received the Courage in Editorial Cartooning Prize from the Cartoonists Rights Network International in 2010. Learn about the inspiration behind Neyestani's book, and read another story of immigration, in Paul Smalera's memoir/ review. Cover of the book How to be an Alien, created by Nicolas Bentley, 1946. Read French? 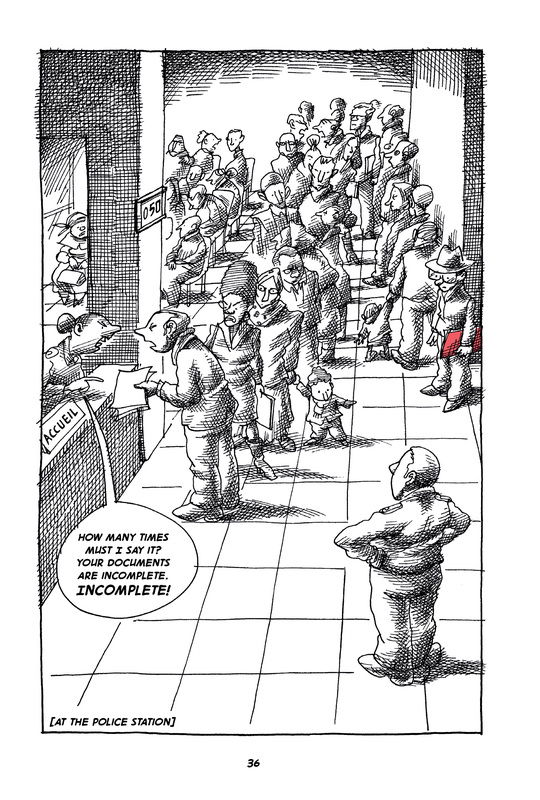 Try this interview: Mana Neyestani, dessinateur iranien et réfugié politique. His use of an Azeri word for "cockroach" in a children's cartoon published in May 2006 triggered riots among the Azeri minority, already persecuted by the Iranian government. The newspaper closed and Neyestani spent months in prison. Find out why an Iranian immigrant might come to Paris, in particular, in this entry from Columbia University's Encyclopedia Iranica. "A real refugee would . . ."
Read, watch, and listen to contemporary stories about immigration to the United States and migration around the world, beginning with Mohammed Elsaleh's TEDx talk "The Refugee Crisis: Coming to a Doorstep Near You." Then, read 9 myths and facts about immigration from the Anti-Defamation League. You can find more stories of refugees and immigrants in The New York Times, The Washington Post, and in the UN’s video archive. "Jihadists!" "Refugees?" 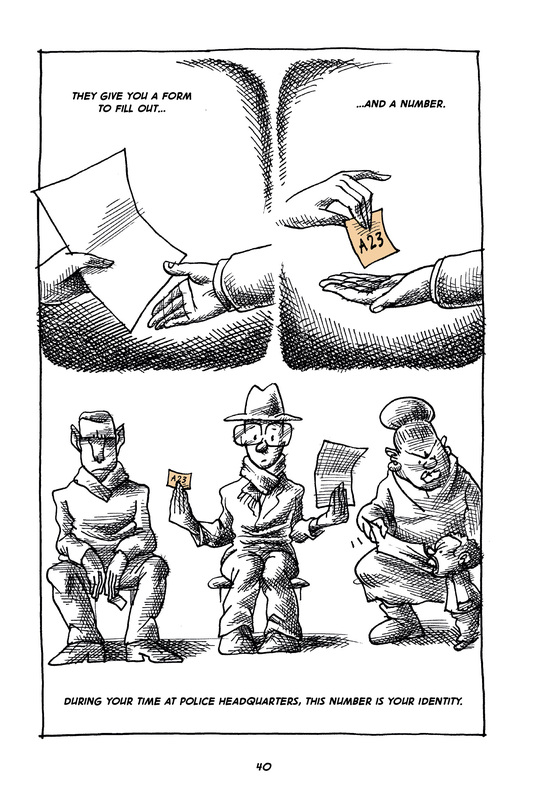 See more work from Mana Neyestani on the United Sketches website. Next, read an excerpt from his memoir of the events that forced him to leave Iran, "An Iranian Metamorphosis," in the magazine WWB. Or, read the entire book. 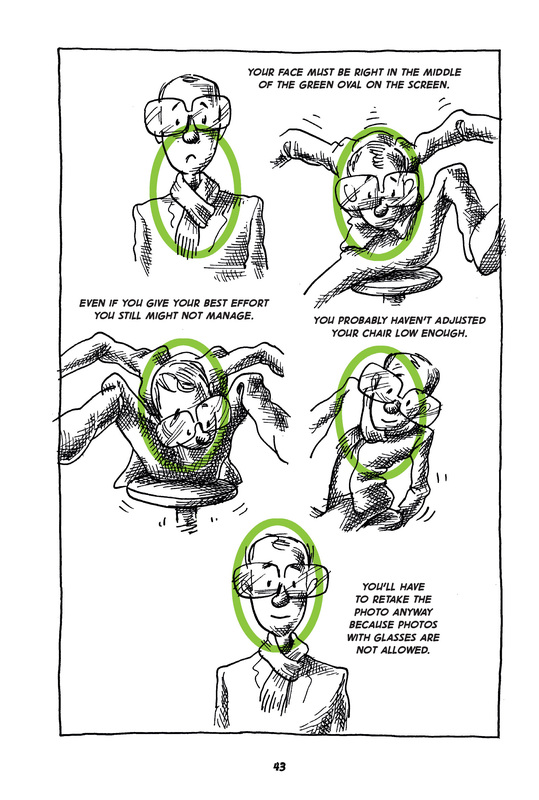 Panels from "An Iranian Metamorphosis," showing a blindfolded prisoner walking, and a man telling him, "Good morning, Mr. Neyestani. Sorry I have bad news." Later this year, the memoir will be re-published on this website. Finally, you can read Neyestami's entire 2003 collection, Tout va Bien! ("Everything is going well! "), in Sampsonia Way, an online magazine sponsored by City of Asylum/ Pittsburgh. Watch a YouTube video that sets Neystani's drawings to electronic music. (Some explicit language). Or, find Neyestani on Facebook, where he has several hundred thousand followers. 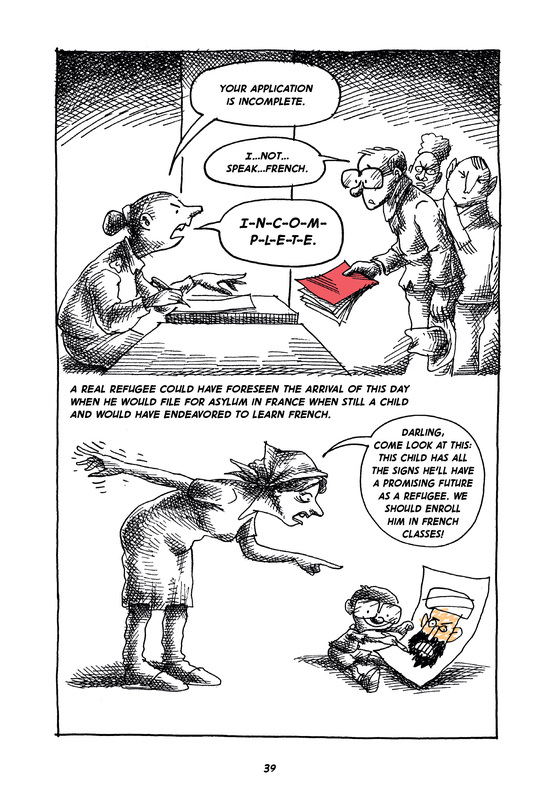 "My comic book writer and cartoonist friend Mana Neyestani, who had gone through the whole process of applying for asylum in Paris, was of great help with the details. When he told me that the Préfecture de Police is located on a street called Ney Boulevard, the story began to take shape." Then, watch Ghazal Mosadegh and Ryan Van Winkle perform a multi-lingual poem they wrote together. Mosadegh wrote of this experience, "We decided on the theme of distance, travel and time and used some Spanish and Persian words and sentences." You can read the poem on Ryan Van Winkle's blog. 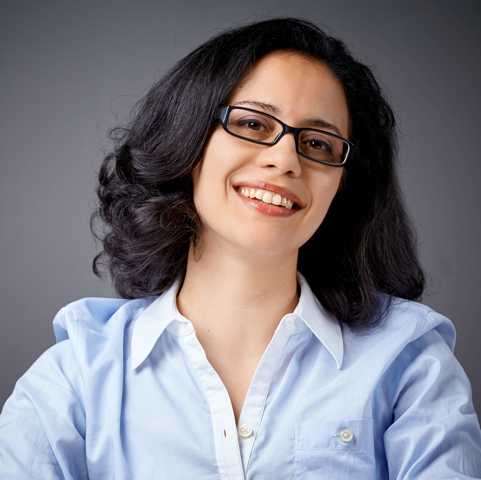 Finally, you can find more fiction from Mosadegh in her book Biographies, "extra-ordinary biographies plus ordinary chairs," available from Susak Press. Flaubert's Parrot and A History of the World in 10 1/2 Chapters, two novels by Julian Barnes. The first is a quasi-biography; the second, a quasi-history. A guide to living "like a local in Paris," aimed at a very different kind of new arrival from the refugees in this comic. Marjane Satrapi speaking at the film premiere of Persepolis, 2007. By Rama. 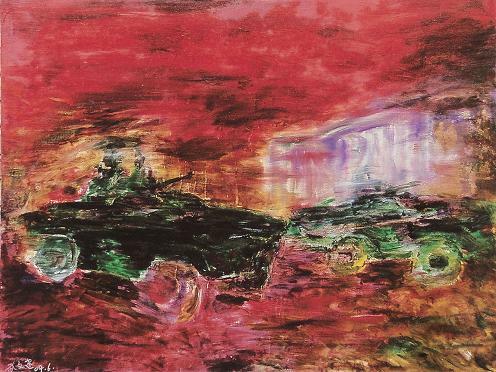 From the series "Eternal Sorrow," by Wu Wenjian, an artist and former protester in the Tiananmen Square Uprising. 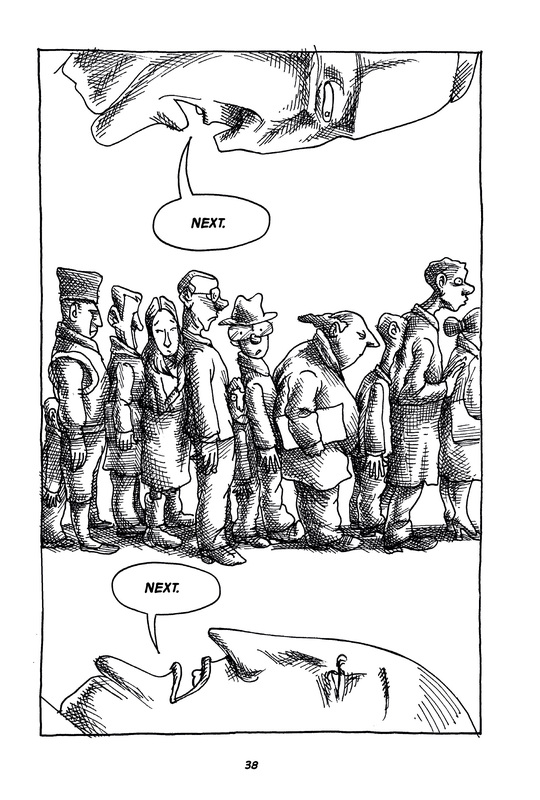 The Queue, an excerpt from a dystopian novel about people waiting in line. The Iliad, by Homer. Homer takes care that the individual soldiers remain individuals, even in the thick of battle, and that their deaths matter.